1 A None No Power Seat 1 A is a standard World Business bulkhead seat however, the proximity to the lavatory and galleys may be bothersome. 1 K None No Power Seat 1 K is a standard World Business bulkhead seat however, the proximity to the lavatory and galleys may be bothersome. 10 A None No Power Seat 10 A is a standard Economy Comfort bulkhead seat that may have some extra legroom however, the close proximity to the galleys may be bothersome. There is no floor storage for this seat during takeoff and landing. 10 B None No Power Seat 10 B is a standard Economy Comfort bulkhead seat that may have some extra legroom however, the close proximity to the galleys may be bothersome. There is no floor storage for this seat during takeoff and landing. 10 C None No Power Seat 10 C is a standard Economy Comfort bulkhead seat that may have some extra legroom however, the close proximity to the galleys may be bothersome. There is no floor storage for this seat during takeoff and landing. 10 D None No Power Seat 10 D is a standard Economy Comfort bulkhead seat that may have some extra legroom however, the close proximity to the galleys may be bothersome. There is no floor storage for this seat during takeoff and landing. 10 E None No Power Seat 10 E is a standard Economy Comfort bulkhead seat that may have some extra legroom however, the close proximity to the galleys may be bothersome. There is no floor storage for this seat during takeoff and landing. 10 G None No Power Seat 10 G is a standard Economy Comfort bulkhead seat that may have some extra legroom however, the close proximity to the galleys may be bothersome. There is no floor storage for this seat during takeoff and landing. 10 H None No Power Seat 10 H is a standard Economy Comfort bulkhead seat that may have some extra legroom however, the close proximity to the galleys may be bothersome. There is no floor storage for this seat during takeoff and landing. 10 J None No Power Seat 10 J is a standard Economy Comfort bulkhead seat that may have some extra legroom however, the close proximity to the galleys may be bothersome. There is no floor storage for this seat during takeoff and landing. 10 K None No Power Seat 10 K is a standard Economy Comfort bulkhead seat that may have some extra legroom however, the close proximity to the galleys may be bothersome. There is no floor storage for this seat during takeoff and landing. 15 A None No Power Seat 15 A is a standard Economy Comfort seat. 15 B None No Power Seat 15 B is a standard Economy Comfort seat. 15 C None No Power Seat 15 C is a standard Economy Comfort seat. 15 D None No Power Seat 15 D is a standard Economy Comfort seat. 15 E None No Power Seat 15 E is a standard Economy Comfort seat. 15 G None No Power Seat 15 G is a standard Economy Comfort seat. 15 H None No Power Seat 15 H is a standard Economy Comfort seat. 15 J None No Power Seat 15 J is a standard Economy Comfort seat. 15 K None No Power Seat 15 K is a standard Economy Comfort seat. 16 D None No Power Seat 16 D is a standard Economy Comfort seat. 16 E None No Power Seat 16 E is a standard Economy Comfort seat. 16 G None No Power Seat 16 G is a standard Economy Comfort seat. 2 D None No Power Seat 2 D is a standard World Business bulkhead seat however, the proximity to the lavatory and galleys may be bothersome. 2 G None No Power Seat 2 G is a standard World Business bulkhead seat however, the proximity to the lavatory and galleys may be bothersome. 25 A None No Power Seat 25 A is a standard Economy Class seat however, the close proximity to the lavatories may be bothersome. 25 B None No Power Seat 25 B is a standard Economy Class seat however, the close proximity to the lavatories may be bothersome. 25 C None No Power Seat 25 C is a standard Economy Class seat however, the close proximity to the lavatories may be bothersome. 25 D None No Power Seat 25 D is a standard Economy Class seat however, the close proximity to the lavatories may be bothersome. 25 E None No Power Seat 25 E is a standard Economy Class seat however, the close proximity to the lavatories may be bothersome. 25 G None No Power Seat 25 G is a standard Economy Class seat however, the close proximity to the lavatories may be bothersome. 25 H None No Power Seat 25 H is a standard Economy Class seat however, the close proximity to the lavatories may be bothersome. 25 J None No Power Seat 25 J is a standard Economy Class seat however, the close proximity to the lavatories may be bothersome. 25 K None No Power Seat 25 K is a standard Economy Class seat however, the close proximity to the lavatories may be bothersome. 30 A None No Power Seat 30 A is a standard Economy Class seat that has extra legroom due to the exit however the close proximity to the lavatories may be bothersome. This seat is missing a window. The Exit Door protrusion may be bothersome. The tray table is in the armrest, making the armrests immovable and slightly reducing seat width. There is no floor storage for this seat during takeoff and landing. 30 B None No Power Seat 30 B is a standard Economy Class seat that has extra legroom due to the exit however the close proximity to the lavatories may be bothersome. The tray table is in the armrest, making the armrests immovable and slightly reducing seat width. There is no floor storage for this seat during takeoff and landing. 30 C None No Power Seat 30 C is a standard Economy Class seat that has extra legroom due to the exit however the close proximity to the lavatories may be bothersome. The tray table is in the armrest, making the armrests immovable and slightly reducing seat width. There is no floor storage for this seat during takeoff and landing. 30 D None No Power Seat 30 D is a standard Economy Class bulkhead seat however, the close proximity to the lavatories may be bothersome. There is no floor storage for this seat during takeoff and landing. 30 E None No Power Seat 30 E is a standard Economy Class bulkhead seat however, the close proximity to the lavatories may be bothersome. There is no floor storage for this seat during takeoff and landing. 30 G None No Power Seat 30 G is a standard Economy Class bulkhead seat however, the close proximity to the lavatories may be bothersome. There is no floor storage for this seat during takeoff and landing. 30 H None No Power Seat 30 H is a standard Economy Class seat that has extra legroom due to the exit however the close proximity to the lavatories may be bothersome. The tray table is in the armrest, making the armrests immovable and slightly reducing seat width. There is no floor storage for this seat during takeoff and landing. 30 J None No Power Seat 30 J is a standard Economy Class seat that has extra legroom due to the exit however the close proximity to the lavatories may be bothersome. The tray table is in the armrest, making the armrests immovable and slightly reducing seat width. There is no floor storage for this seat during takeoff and landing. 30 K None No Power Seat 30 K is a standard Economy Class seat that has extra legroom due to the exit however the close proximity to the lavatories may be bothersome. This seat is missing a window. The Exit Door protrusion may be bothersome. The tray table is in the armrest, making the armrests immovable and slightly reducing seat width. There is no floor storage for this seat during takeoff and landing. 41 A None No Power Seat 41 A is a standard Economy Class seat that is missing a window. 41 K None No Power Seat 41 K is a standard Economy Class seat that is missing a window. 42 D None No Power Seat 42 D is a standard Economy Class seat. Passengers have reported that there is no overhead storage for this seat. 42 E None No Power Seat 42 E is a standard Economy Class seat. Passengers have reported that there is no overhead storage for this seat. 42 G None No Power Seat 42 G is a standard Economy Class seat. Passengers have reported that there is no overhead storage for this seat. 43 A None No Power Seat 43 A is an Economy Class seat located in the last row of the aircraft that may have limited to no recline. The proximity to the lavatory and galleys may be bothersome. 43 B None No Power Seat 43 B is an Economy Class seat located in the last row of the aircraft that may have limited to no recline. The proximity to the lavatory and galleys may be bothersome. 43 C None No Power Seat 43 C is an Economy Class seat located in the last row of the aircraft that may have limited to no recline. The proximity to the lavatory and galleys may be bothersome. 43 D None No Power Seat 43 D is a standard Economy Class seat however, the proximity to the lavatory may be bothersome. Passengers have reported that there is no overhead storage for this seat. 43 E None No Power Seat 43 E is a standard Economy Class seat. Passengers have reported that there is no overhead storage for this seat. 43 G None No Power Seat 43 G is a standard Economy Class seat however, the proximity to the lavatory may be bothersome. Passengers have reported that there is no overhead storage for this seat. 43 H None No Power Seat 43 H is an Economy Class seat located in the last row of the aircraft that may have limited to no recline. The proximity to the galleys may be bothersome. 43 J None No Power Seat 43 J is an Economy Class seat located in the last row of the aircraft that may have limited to no recline. The proximity to the galleys may be bothersome. 43 K None No Power Seat 43 K is an Economy Class seat located in the last row of the aircraft that may have limited to no recline. The proximity to the galleys may be bothersome. 44 D None No Power Seat 44 D is an Economy Class seat located in the last row of the aircraft that may have limited to no recline. The proximity to the lavatory and galleys may be bothersome. Passengers have reported that there is no overhead storage for this seat. 44 E None No Power Seat 44 E is an Economy Class seat located in the last row of the aircraft that may have limited to no recline. The proximity to the lavatory and galleys may be bothersome. Passengers have reported that there is no overhead storage for this seat. 44 G None No Power Seat 44 G is an Economy Class seat located in the last row of the aircraft that may have limited to no recline. The proximity to the lavatory and galleys may be bothersome. Passengers have reported that there is no overhead storage for this seat. 5 A None No Power Seat 5 A is a standard World Business seat that is missing a window. 5 D None No Power Seat 5 D is a standard World Business seat. 5 G None No Power Seat 5 G is a standard World Business seat. 5 K None No Power Seat 5 K is a standard World Business seat that is missing a window. 6 A None No Power Seat 6 A is a standard World Business seat. 6 D None No Power Seat 6 D is a standard World Business seat. 6 G None No Power Seat 6 G is a standard World Business seat. 6 K None No Power Seat 6 K is a standard World Business seat. 7 A None No Power Seat 7 A is a standard World Business seat. 7 D None No Power Seat 7 D is a standard World Business seat. 7 G None No Power Seat 7 G is a standard World Business seat. 7 K None No Power Seat 7 K is a standard World Business seat. 8 A None No Power Seat 8 A is a standard World Business seat. 8 D None No Power Seat 8 D is a standard World Business seat. 8 G None No Power Seat 8 G is a standard World Business seat. 8 K None No Power Seat 8 K is a standard World Business seat. Personal Audio Visual on Demand (AVOD) is available on this aircraft with an extensive selection of audio programming in multiple languages. Personal Audio Visual on Demand (AVOD) is available on this aircraft with an extensive selection of movies, short programs and television series in multiple languages. Wi-Fi connectivity is available onaboard this aircraft to all passengers. This Boeing 787-9 features a two class configuration with 30 flat bed World Business seats, 48 Economy Comfort seats, and 216 standard Economy Class seats. Armrest does not come up. Stays down. Just traveled GIG-AMS and was forced to choose 40G & E, 'cause KLM didn't realase all the free seats in Economy cabin; by the way, "congrats" KLM! 40G - awful seat, limited recline, and in addition 39G (in front) has a huge recline, and your monitor is 10 cm from your face. Overall the KLM Dream liner was NOT an impressive aircraft. I wah hoping for something else better than this cheap & regular "bus". The full flat bed seat is long enough for tall people like me! (I am 6'3") I flew many times bc on several major airlines and this was the first time that I was able to lie down fully stretched out on a flat bed! I think this applies to all business class seats in this aircraft configuration. Flew Amsterdam to Osaka and back in 14H. 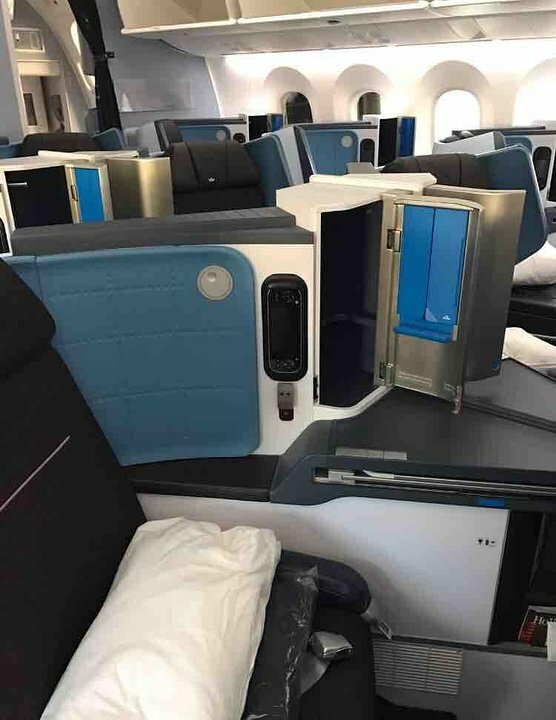 I was pleasantly surprised by this seat after reading other comments here about how hard and narrow the economy (comfort) seats are on KLM's 787s. As far as the seat goes, it seemed no different than the economy seats on Delta or other legacy carriers. Yes the 100 euro upgrade for economy comfort is a bit steep for what you get, but being rather tall I didn't regret it. 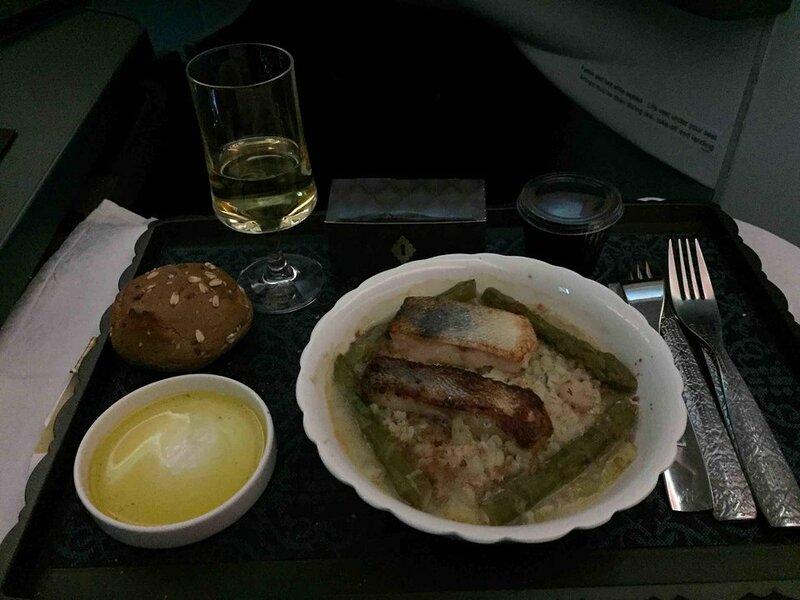 Friendly cabin crew and decent meals both ways. The larger windows and better cabin pressure were nice too. Would fly this aircraft / seat again. 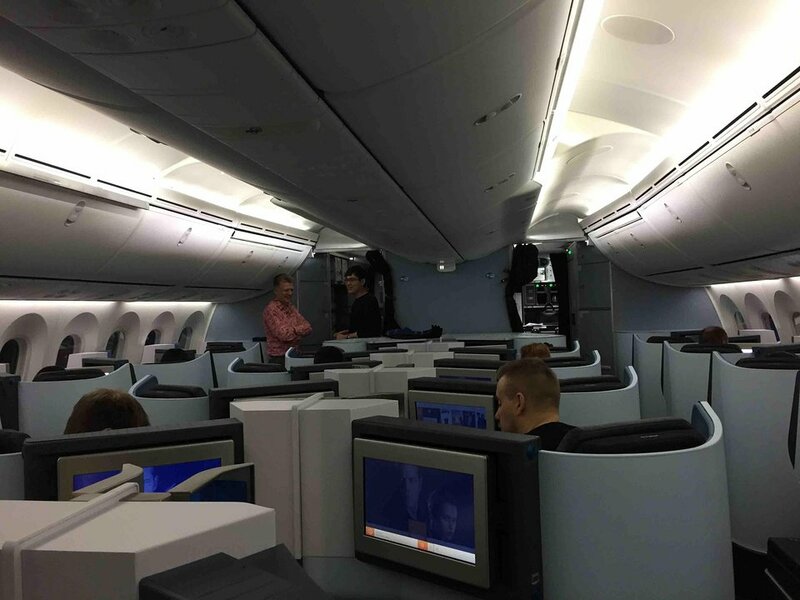 Very uncomfortable seats in dreamliner 787-9 in economy, extremely hard and narrow. JAL config is much better with 2-4-2. Airco is very poor as well. Flew business class. Chose 1K bc read the service was slow but the terrible proximity to bathroom was very annoying. I didnt expect so much traffic to the lavatory due to the small cabin but it was like every 5 minutes someone was going to the bathroom! Also i can hear the toilet flushing!! Gross. The main issue with 14K is if you have wide shoulders like I do, the wall juts out into your shoulder space making it quite difficult to get comfortable. Additionally, the economy class seats are quite hard so you end up having a bit of a sore bum at the end. I don't think economy comfort is worth the price as the seat is just as narrow as regular economy and the extra legroom is fairly negligible. Seats are behind economy comfort: the angle to lay down is the double from the economy class (including Preferred seat). I travelled IAH to AMS in seat 5k then returned in 4k. The business class seat is hard and is awkward. I would hit my left knee on the round protrusion which is where the seat ahead of me lies down into. The right armrest was very awkward with a curvature which made it hard to rest my right arm. I also kept hitting the seat controls Anyway, a poorly ergonomically designed seat. Horrible seat. Constantly passengers and crew is bumping into you due to the seat location half way into the aisle. If you are stretcing out, your legs will reach into the entry area of the galley, resulting in the crew inadvertantly kicking your feet. Even the middle seat woul be better. It is a standard business seat with a decent amount of space on the side, including a compartment where you can place small items. I couldn't get the recline to go a full 180 degrees, and the USB port did not work very well. The temperature and positioning by the window was fine. Traveled from Amsterdam to San Francisco. Chose 42G both ways. Terrible choice - I should have upgraded to Economy Plus. 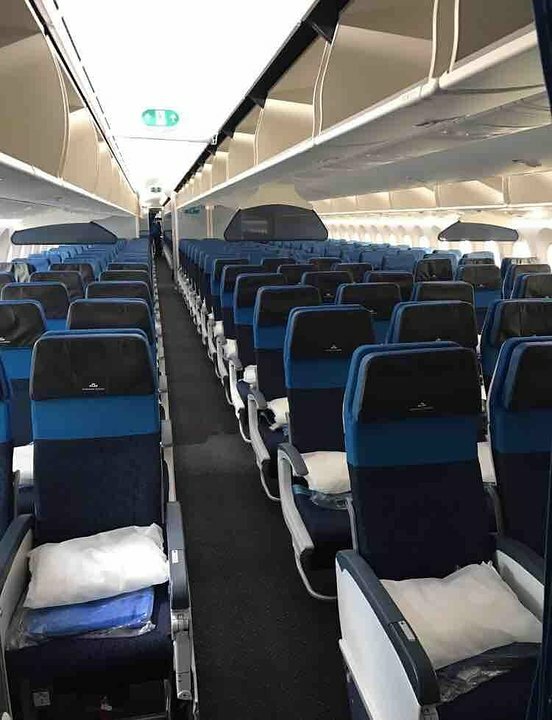 Overall the KLM Dream liner was NOT an impressive aircraft, more akin to a very expensive "Cattle Wagon"
On this seat you are facing a wall, and have really great legspace. However - some people can't really tell the difference between the public aisle and your space in the front, and there at times there was an intense traffic in my space where people were kicking my legs, especially the Chinese people on board. As has been mentioned by many others the seats are extremely narrow, and I constantly hit the light button and the seat incline button accidentally. Review of 11/27/17 mentions uncomfortable seats in economy. Seats in Business are uncomfortable as well - hard as rocks! Although they flatten out, they are so narrow that, every time I tried to turn over, I hit one of the controls, and turned on the lights, or adjusted the seat straight up again. Although the middle seats are angles towards each other, there is a console between them that makes it difficult to hold a conversation with the person next to you, fine, if you're a single on business, but not if you are with family or friends. There is no place to store anything under the seat, so be prepared to put everything in the (generous) upper storage bin. Plane was smooth in turbulence where I feel older planes would have been crashy and more bumpy. Cabin crew was great and attentive. However, seats in economy were AWFUL with next to no padding. I am 5'11" and 160lbs with no health issues and was in pain after just three hours and had to use the little pillow to support my rear. Felt the pain after landing. KLM's domestic economy is more comfortable, strangely. Wifi while fast and actually offered on this plane (unlike most other KLM flights) was based on how much data you use and the data limits were rather low with expensive pricing plans. Hence when you ran out of data you would have to buy more. Overall, a nice experience but deeply marred by the uncomfortable seats. 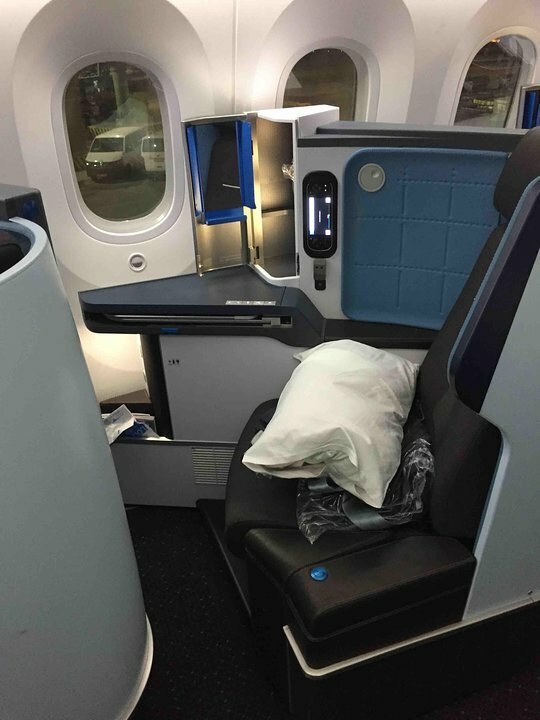 I have avoided the KLM 787 jet for long haul since then, especially when Delta's economy seats are FAR superior in comfort. AMS to CTU in the 789. Comfortable seat, quiet cabin (less noise than other planes), very good entertainment system with decent screen and outstanding service as always for KLM! Check pictures for more details. There is more noise than normal because is close to the galley and more noise from staff and other travellers going for snacks. This is one of the best located seats, isolated from noise and a single window seat. The 9 abreast seating makes the window seat shoulder width narrower than on most other aircraft (737 has more room). The air ventilation is no good. There is no passenger adjustable air vent on the 787. The sun was beating down against the left side of the aircraft for hours, it felt like I was sitting next to an oven. The 787 has thin walls and not much insulation, making the window passenger suffer with heat or cold. The composite materials do not conduct heat away, so you can't get cooled down. I paid for the economy comfort upgrade, but it was not comfortable. The seat padding is like sitting on a wood bench. After 4 hours my legs were numb with circulation cut off. The seat frames are lightly built and flimsy with no rigidity. The heavy passenger sitting in front of me caused the seat frame to bend and deflect backwards into my space, causing the in-flight entertainment display to constantly bob up and down. Very annoying. By comparison the older 747 economy comfort is far superior. After 11 hours of torture I finally got out of the aircraft. I was very disappointed with my first flight on the 787 after read about how great the 787 is supposed to be. I will avoid flying on the Boeing 787 in the future. THis seat is nice for pepole that has long legs, but if you are overwegiht or very big boned, it is a very small width. I would probaly gues it is about 16 an not 17 as seat guru has written. I had the embraer 190 fron ansterda and that has a seath with of 17.5 and i had good room. I was really excited to board the Dreamliner. The crew was great, the aircraft very modern, but the seats... the person who invented them certainly doesn't fly 12 hours on economy. I'm not talking about the ridiculous width, but rather the very slim and insufficient padding. 5 hours into the flight I couldn't sleep, I couldn't sit because my legs hurt terribly and I couldn't get up because the 2 people next to me were apparently managing the impossible. I sat on my pillow, I sat on my knees, I even tried standing on that ridiculous little space. Seriously, avoid it like the plague. I was expecting better seating in the 787, but found the seat very tight with almost no legroom, shoulders and arms touch each other. Plane is more noisy than expected. The Emirates A380 economy is in my opnion much better in seating and noise. Extremely bad seat! Do not waste your money. The emergency gate has a big bump right on your legs, so you have even less space than a regular economy seat. Flew this roundtrip AMS-SFO economy class. I had to pay for the first time for my choice of seats this year (20 euros each trip). Chose seat 42G towards the back in hopes of having a seat next to me empty. This was successful in the journey to SFO, but the plane was completely full on my return journey to AMS probably because this fell on a Saturday. Note - the center aisle seats from row 42-44 have no direct overhead storage, you have to use the bins on the window section seats. I understand that the sleeping bunks for the crew are overhead here. Row 41 window section seats have no window (only a sliver of the window from row 40). The seating is 3-3-3 in all of economy class unlike in a 747 where you have sets of 2 seats in the tapered end of the plane (where I like to sit if Im flying with my partner). Comfort was average for economy class. The sphere colored lighting in the windows was pleasant. Cabin noise was not noticeably quieter as promoted. Only one toilet in the back of the plane. Entertainment system was good, the touchscreen was a new feature and there was a large selection of movies, tv shows & music. Theres also a usb charging port for small devices. Good seat. Recline is good, pitch from divider is good. In flight entertainment system (on demand video) with USB connection available. premium economy is hardly worth the extra money.they give you a bit of extra pitch, but thats it. !D is in the center section, so you have no window. I traveled with my husband who had 1G next to me. If you are traveling with someone, the only seats together are in the center section. This was a long, overnight flight from Amsterdam - Kuala Lumpur. We liked these seats, although they are rated by SeatGuru as "Yellow" due to proximty to the bathroom/galley. It was a long flight and we wanted to sleep, but we didn't find these seats to be disturbed. Also, a benefit was the large bulkhead in front of us which served as a sort of extra tabletop for our stuff. We very much liked the conveniences of these seats. They were lie flat and had lots of little compartments to store your stuff. A little cupboard with a mirror (near your elbow) which separated you from the seat next to you. Also, a closed storage bin near your feet. Convenient reading light, although it could have been brighter for reading. Really enjoyed music selection and curation of the music. These seats were moderately comfortable for sleeping. I found them better than most (I fly KLM partner Delta often and they have very uncomfortable seats) Service was good as usual for KLM. Flew from Toronto to Amsterdam on this plane on 12th of September 2016. The seat was good with good leg room. Crew and service was excellent. Very nice new aircraft. Well done KLM. Flew this AMS-SFO.....Just to reinforce, there are TWO bathrooms in business class. The illustration on seatguru should be updated to reflect this fact. 5D/G were fine seats, the 787-9 really comfortable and smooth. Surprisingly good food, very pleasant flight attendants and large TV screen, showing some pretty dated films. Flew Hangzhou to Amsterdam Sunday August 14th. My seat number was 12k, it's a economy plus seat you pay a little extra for. Generally the 787 is a nice plane, however I don't understand the big fuss about. All the nice words about how silent it is and how much better the enviroment onboard is, is far over rated. No to the seat, a economy seat that folds down 20°. What a drama, rock hard, no lumbar support. According to seatguru the seats are 17,5", never! Leg room was OK. These seats way tighter than in the KLM 777 and 747. The AVOD screen does not fold out so it also inclines 20° with the seat infront. The food was terrible. This was my worst flying experience ever. It's time that economy seats get minimum dimensions over the industry. Flew on the newest (at the time) 787 of KLM's Fleet: "Hibiscus". The plane had and excellent AVOD system and found the windowing technology better than expected. The windows went virtually opaque and I did not encounter the problem that some have mentioned about the windows not getting dark enough. Seat pitch and comfort is the weakest point for economy class passengers: 31 inches is pretty tight and I'm a normal 5'11! Also the lack of extra cushioning meant I needed to get up various times during the flight to stretch. Overall a very good plane and KLM service was excellent. For all buss. Class passengers there is one more toilet avalable just like on 787-8 KQ. So there are 2 toilets, not 1. My husband and I found the Business Class seats uncomfortable. They are hard and rather small, and though we are both short, we couldn't really get comfortable enough to sleep. The seat is also so far from the window that you have to stand to see out. It's difficult to adjust the brightness of the windows as the color changes slowly. And they seem poorly designed for storage. After all the hype, I was disappointed in this plane especially for the long flight from KIX to AMS. Travelled from Amsterdam to Kansai, Osaka and was pretty impressed with the new aircraft - clean and crisp (perhaps due to the new aircraft?!). We sat in economy seat 21J & K and both had adequate leg space. The inflight entertainment and cabin were very good. The new seats are excellent! There are two lavatories in the front, not one! Just average economy chair, with the window a little bit too the front so you could rest against the bulkhead. Didn't feel as comfortable tho as on the way back in a 777 new style seat for some reason. Row 10 not as good as in older klm planes like 777 and a330. Couldn't stretch legs so rather go for row 11. Row 10 seat are quite OK. I couldnt fully stretch my legs (1.88cm) but still prefer this row compared to regular economy comforts seats. Video entertainment system is best I had so far. Large (touch)screens and extensive collection. Economy comfort, but don't expect premium economy. Extra leg room, but no extra width. Other airlines you get more with premium economy. A little more legroom because economy comfort starts de row in front. However, because it is the centre seat, it is less comfortable. KLM flies 1 versions of Boeing 787-9.